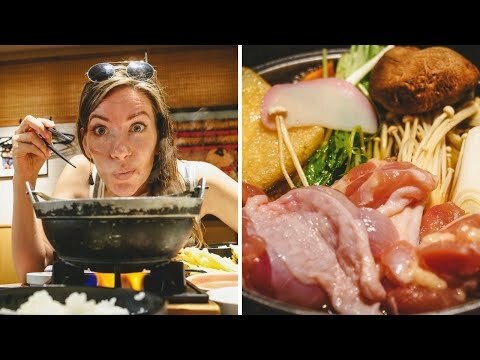 Come join us for Japanese Sumo Food as we try eating Chankonabe Stew (ちゃんこ鍋) at Hananomai Ryokoku restaurant in Tokyo, Japan. This fascinating sumo meal is a nabemono one-pot dish as part of a weight-gain diet. Chankonabe contains dashi or chicken broth soup base with sake/mirin with chicken (skin left on), tofu, vegetables (daikon and bok choy) and other types of ingredients. It is healthy because it is protein rich and filling. If you’re in Tokyo, Japan we’d recommend you try it! Here is everything you’ll need to go and visit yourself. Alright guys good morning so today we are having a Sumo themed day here in Tokyo. We are planning to take part in a few different Sumo themed activities so we’ve come to Rio Goku station and in this area they have a lot of restaurants where you can have a Sumo meal. This is like hearty heavy stew that Sumo wrestlers eat to put on weight. So we’re going to a sumo restaurant. We’re going to have Chankonabe Stew (ちゃんこ鍋) that hearty stew. Apparently the restaurant we are going to also puts on sumo wrestling performances. So hopefully the timing works out so that we can see sumo wrestlers in action. Okay so we found the restaurant that specializes in Sumo food. It is called Hananomai Ryokoku and it is right outside the train station. It is actually underneath the tracks. So you can hear the train passing by and the first time Sam was like earthquake? Yeah. It is going to be our first time to try this food as well. Yes. Sumo food. So the food arrived super quickly. I know. Shockingly quick. Oh my. So we ordered two separate sets. Sam went for the Chankonabe which is the sumo stew to put on weight and we got the chicken one and it comes with like chicken skin. Oh yeah. That is a protein heavy meal. Big time. We even got an egg there. What else do you have? There if some tofu. Yeah. You even got sashimi. That was a cool surprise. I feel like this is for rice. Or maybe it is for your soup. Where is your rice. The rice is in here. Lift that up. So the whole idea is that you eat the stew with rice and beer so that you are getting lots of calories into your system. So it looks really good. We’re going to let that cook for a while. It is a high calorie meal and it is also a high protein meal as well. And for me I got the tempura set with sashimi and rice. I have some tofu with a bit of ginger. This looks like a pickled radish. I have sashimi. This is my miso soup. You got miso. A little salad here. We came for the sumo food. That is right. Alright guys so finished lunch and we were able to figure out that there is no sumo wrestling show today. The price was about 2,700 Yen. I would say just under $25 US dollars for two people. $12.50 per person. It was a lot of food. Very filling. Cool ambience. It is a beautiful restaurant inside. I also found the service to be really good. It was starting to get very busy in there by the time we left. Big lunch crowds. And from here we’re going to head over to the Sumo Museum so that is coming up next.